Acid reflux or gastric esophageal reflux disease (GERD) is one of the most common conditions affecting Americans today. 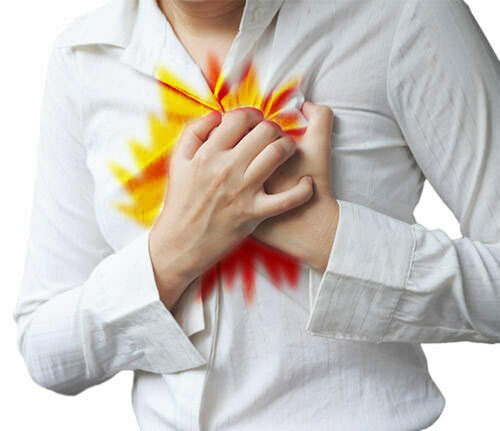 This condition is characterized by a burning sensation in the chest that has coined the term “heartburn.” An anti-inflammatory lifestyle has been shown to beat acid reflux naturally. Upon eating, food naturally passes from the throat to the stomach through the esophagus. The esophagus contains a group of muscle fibers in the shape of a ring that prevent food from moving backward from the stomach to the esophagus. These muscle fibers make the lower esophageal sphincter (LES). If the LES is not closing well it allows for food, liquid and hydrochloric acid to leak back into the esophagus. The inner esophageal tissue is not designed to handle the strong acidity which inflames the region. This causes the characteristic heartburn sensation. Chronically damaging the esophageal tissue often results in esophageal cancer and other more serious conditions. The most common risk factors for GERD include anything that obstructs the esophagus or stomach region such as hiatal hernia, pregnancy, and scleroderma. Other proven risk factors include obesity, smoking, and alcohol usage. Many prescription medications list GERD as a common side effect so this should always be considered. The popular belief is that acid reflux is due to an excessive amount of hydrochloric acid in the stomach. New science has revealed that this is not the case. GERD is most often caused by too little hydrochloric acid being secreted by the stomach. During digestion the stomach secretes acid to lower its pH to around 1.5-2.5 range. More protein in the meal results in a greater need for stomach acid. Individuals with non-obstructive acid reflux are often not able to get their pH low enough. The LES is known to be a pH sensitive valve that initiates closure when pH drops under 3.0. When the stomach does not have enough acid the LES remains open and acid can spill into the esophageal region and damage the tissue. Many people use antacids to relieve the pain of heartburn. This covers up the symptom (reducing acidity) but only makes the problem worse by decreasing the acidity. This process limits the body from effectively digesting the food. This causes further stress on the enzymatic system of the pancreas as well as the other digestive organs. Antacids, processed foods and many medications deplete the body of critical b vitamins and trace minerals that are necessary to create a sufficient supply of stomach acid. An anti-inflammatory lifestyle incorporates a diet rich in phytonutrient dense vegetables, healthy fat and clean protein sources. Healthy fat sources include coconut products, avocados, olive oil, & purified omega-3 fish oil supplements. Healthy protein includes wild-caught fish, grass-fed red meat and free range poultry and eggs. Anti-inflammatory herbs such as turmeric, cinnamon, ginger, oregano & garlic are also powerful aids. Non-processed pink salts, sea vegetables, sea algae and cereal grasses should be used regularly to provide an abundance of critical trace minerals. Individuals should avoid eating excessively large meals. Food should be eaten at least 2 hours before bed to allow gravity to push food through the system. Digestive enzymes and probiotics are particularly helpful at enhancing the digestive process. Raw apple cider vinegar with the fermented mother intact is rich in acetic acid, digestive enzymes and good bacteria. 2 tsp of raw apple cider vinegar in water before a high protein meal is particularly helpful at lowering stomach acid to prepare for digestion. It is also helpful to use apple cider vinegar to marinate meat, as a salad dressing and on grains such as rice.